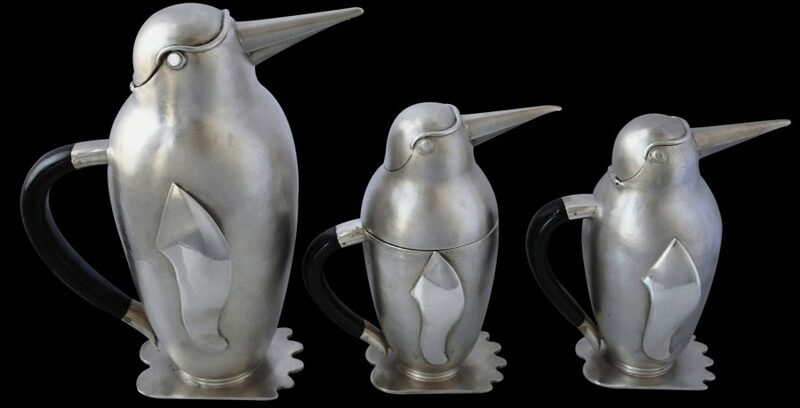 This extraordinary silver tea set comprises a tea pot, a creamer and a covered sugar bowl, each fashioned as a penguin. Each is finely engraved on the wing with the coat of arms of the Maharaja of Bikaner. Why penguins? 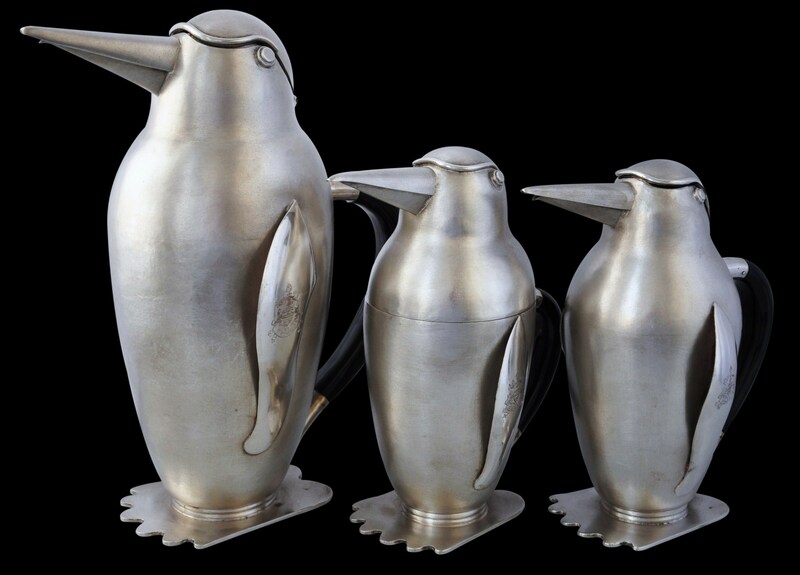 They are in fact emperor penguins and the witticism becomes clear – three emperors for the maharaja! 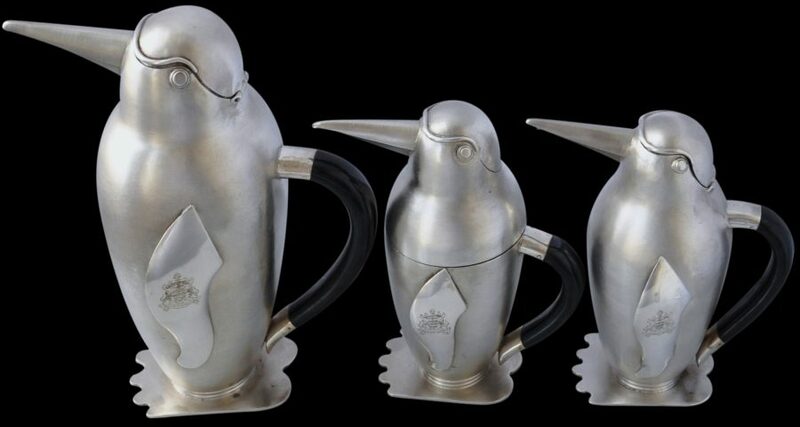 The clean line, slender forms of each vessel are of their age too – they are typically art deco – a taste for which more than several Indian maharajas acquired from Europe, and are possibly influenced by art deco penguin-shaped cocktail shakers of the period. As such they are most probably the product of a Bombay silversmith (each is stamped to the base with an indistinct maker’s mark) and would have been ordered whilst Ganga Singh (reigned 1887-1943) was maharaja. Items of Indian art deco are relatively rare. 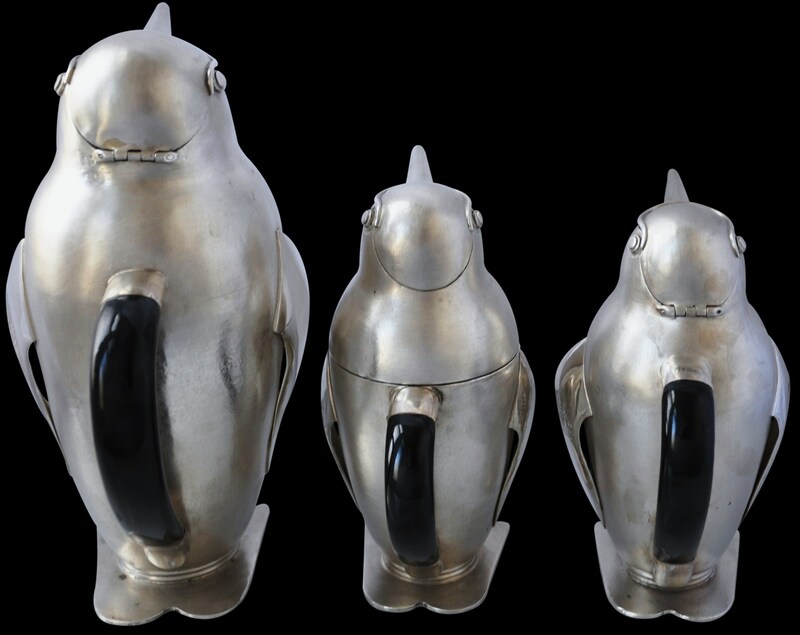 Each of the three vessels stands on a wide foot shaped to give the penguin toes. 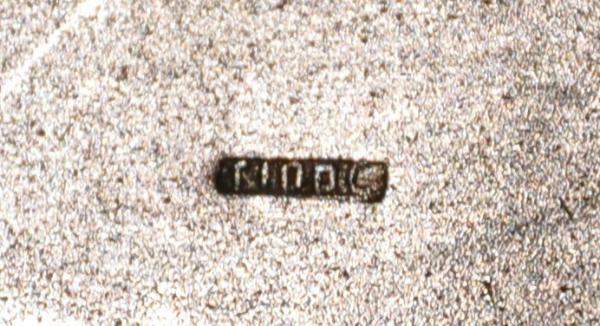 The slender bodies have been tooled all over to give the impression of sand blasting, although the wings (each vessel has one on each side) have been left smooth other than for the coat of arms engraved top one side. The hoods of crests on the creamer and the tea pot are in actual fact hinged lids; the crest on the sugar bowl is fixed – it is the entire upper torso that is the lid which twists off. Each has a curved handle of black bakelite or similar providing a sharp contrast with the ‘whiteness’ of the silver, just as an emperor penguin is sharply black and white. 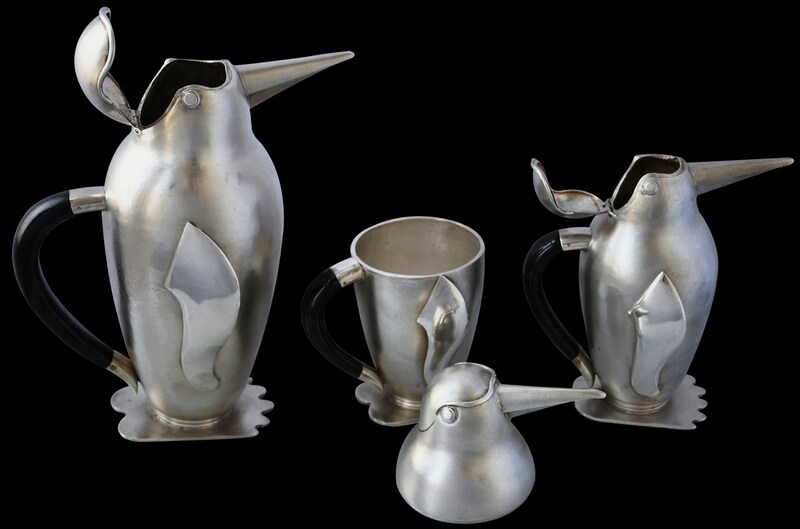 The beaks of the creamer and teapot serve as the spouts; the beak of the sugar bowl is purely decorative. The coat of arms engraved on each of the three penguins comprises a shield with three falcons with supports of a rearing tiger either side and a crest that includes a helmet that is surmounted by a tree. The motto, contained on the ribbon beneath, says in Hindi ‘Jai Jangaldhar Badshah’ or ‘Victory to the King of the Dessert’. 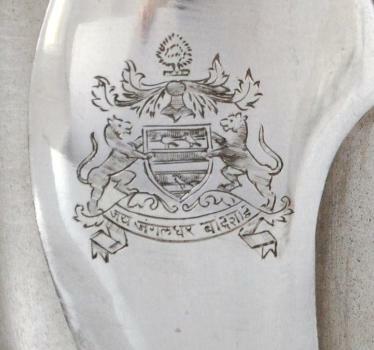 The arms were first granted in the time of Maharaja Dungar Singh who ruled from 1872 to 1887. Bikaner was founded in 1465 by Rao Bika, a son of Jodphur’s ruling family. Collectively, all the Rajput royal families claimed descent from Rama and the sun or Krishna and the moon. All claimed direct links with the ancient Kshatriya caste that is mentioned in the great epics, the Ramayana and the Mahabharata. Ganga Singh (for whom this tea set was undoubtedly made) ascended the throne at the age of seven. 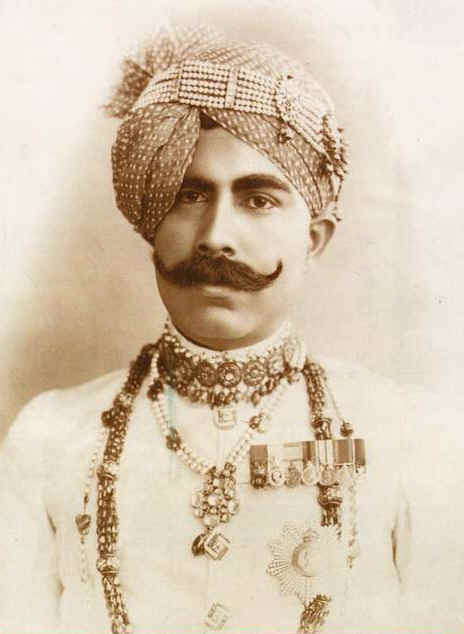 He became one of India’s most prominent princes. He was well educated, had cosmopolitan tastes, Victorian values and Rajput chivalry. He married the Princess of Pratapgarh. Their son was the last crowned ruler of Bikaner. On the occasion of his Golden Jubilee, Ganga Singh famously participated in an ancient Hindu Tula Daan ceremony whereby he sat on a large set of scales and was weighed against gold bars. The cash equivalent was then donated to the charitable Golden Jubilee Fund, as an act of merit. He was a keen polo player and contemporary photographs show him and his polo teammates each wearing polo shirts emblazoned on the front with the Bikaner coat-of-arms – the same arms as engraved on this tea service (see Patnaik, 1996, p. 23). Construction of a great new pink sandstone palace for Ganga Singh – Lallgarh Palace – was commenced in 1896. The Palace combined Rajput and Mughal elements as well as having what was then modern English facilities such as western-style bathrooms, a smoking room and a billiard room. The decoration and fittings were eclectic. Chinese vases, Belgian mirrors, Bohemian crystal chandeliers and Greek sculptures were all featured. Ganga Singh added to the eclecticism over his life time: in 1930 he installed a large crystal boat by Baccarat embellished at either end with gilded cherubs that had been made for the 1900 Universal Exhibition. 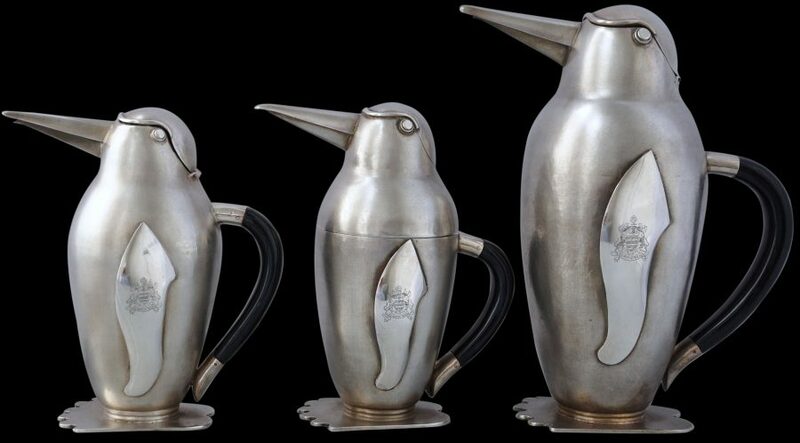 It is not difficult to see how this penguin tea service would not have been out of place. Bikaner was transformed during Ganga Singh’s rule. The state, located in the Thar Desert, flourished with the development of canals and irrigation. (Laying in the middle of a desert, Bikaner has many camels. Camel trains are still to be seen to this day, and the royal house of Bikaner was famous for keeping camel-drawn carriages which were used to transport visiting dignitaries such as the Price and Princess of Wales during an official visit in 1905.) Ganga Singh represented India at the Imperial War Conference in 1917, at the Peace Conference in 1918, and at the League of Nations. The fashion for Art Deco made itself apparent elsewhere among the ruling Rajputs. Lakhdhirji, the Rajput ruler of Morvi in Western Gujarat built an extraordinary palace entirely in the Art Deco style which was linked to the family’s huge Rajput fort by a long suspension bridge. Construction began in 1931 and continued throughout the 1930s. The rectangular contours of the palace resemble those of an ocean liner moored in the sand. Cocktail bars, chrome furniture, a billiard room, and a large indoor swimming pool surrounded by sand-blasted glass and engraved with aquatic motifs all feature. All the furniture was ordered from London and Paris or made in Bombay to European designs. Other Art Deco Rajput palaces were built in Indore and Jodphur. London’s Victoria & Albert Museum staged an exhibition in 2009, ‘Maharaja: The Splendour of India’s Royal Courts’ in which were displayed examples of art deco furniture commissioned for Maharaja Yeshwant Rao Holkar II of Indore and now in the Al-Thani Collection. The condition of the tea set is excellent and consistent with its age. There are no dents or splits. 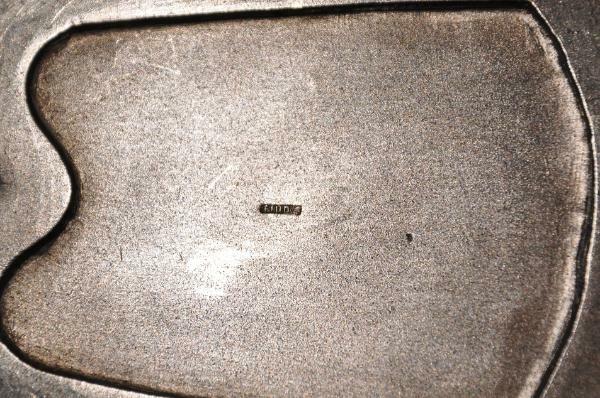 Wear is minimal and is restricted to age-related smoothed patches here and there to the sand-blasted effect surface. The set is evocative, highly decorative and with excellent provenance. 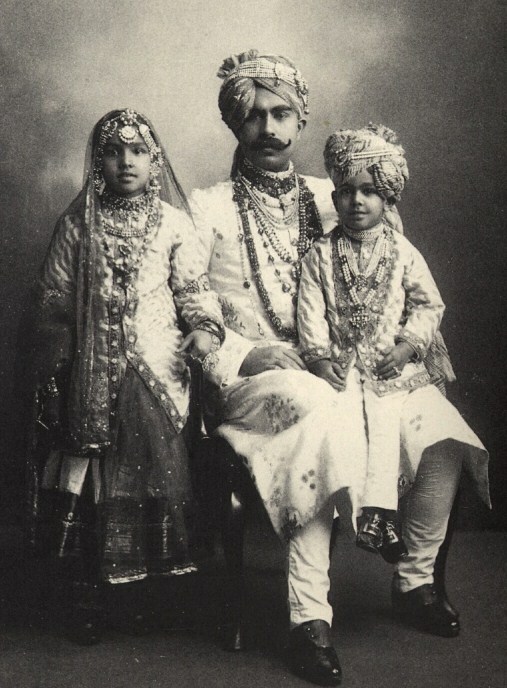 Maharaja Ganga Singh and two of his children. The Mahara’s wife is not seen in tis or indeed any photograph as high-born Rajput ladies observed purdah. 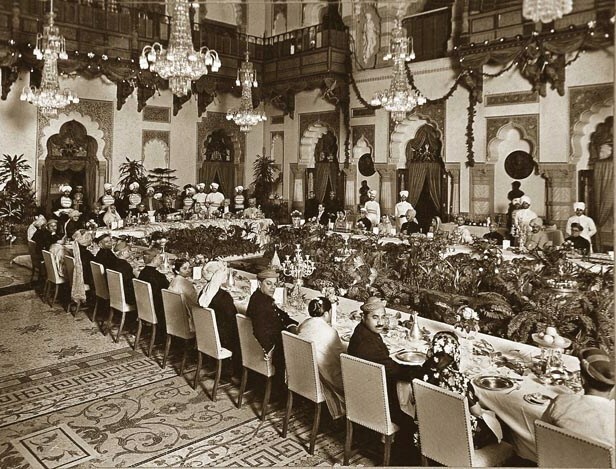 Banquet held in the Baroda’s Laxmi Vilas Palace on the occasion of a state visit of Maharaja Ganga Singh in 1934. 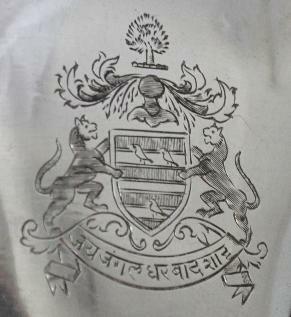 Maharaja Ganga Singh of Bikaner The Bikaner coat-of-arms as engraved on each piece of the tea set. The motto, in Hindi, reads ‘Jai Jangaldhar Badshah’ or ‘Victory to the King of the Dessert’. Patnaik, N., A Desert Kingdom: The Rajputs of Bikaner,Weidenfeld & Nicolson, 1990. Garde, A., & S. Raulet, Maharaja’s Palaces: European Style in Imperial India, Philip Wilson Publishers, 1996. Paul, E. J. & P. Kapoor, The Unforgetable Maharajas: One Hundred and Fifty Years of Photography, New Holland, 2003.